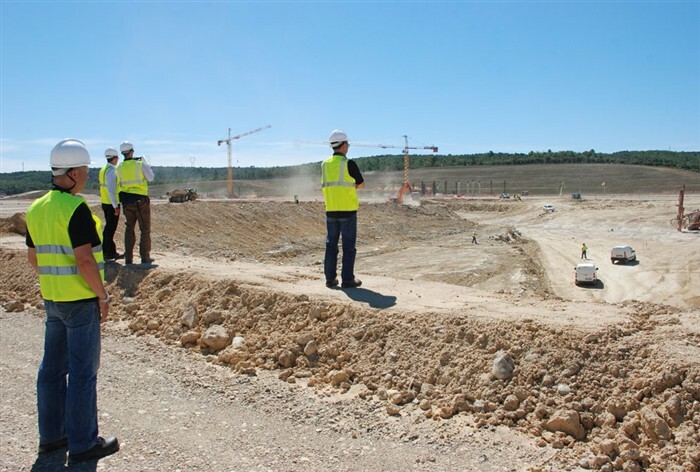 Working is really picking up – the first excavation works for the complex Tokamak building on the ITER site have now started. This is a major step forward after the signature of contract . The first action of the pre-excavation which entails digging and removing 100,000-150,000 m3 of top soil, the loose material, is already concluded. Special rock blasting works have now started and will be carried out during seven weeks in order to remove up to 4000 m3 of soil per day. A standstill period of three months will then ensue and allow for a geologist to check that the actual situation is in line with the assumptions used for the construction design, and, in parallel, the Architect Engineer will further develop this design. A final excavation based on the definitive structural design and the construction of the Tokamak ground support structure will then commence. Progress is also being made on the Poloidal Field (PF) coil building (see article about the contract signing): the first earth levelling works are completed and the first concrete pillars that will reinforce and support the steel frame and the crane in the building which will handle the coils, have been erected. The next step, which will start before the end of September, is the pouring of concrete for the basemat (the floor of the building). The start of the excavation works demonstrates that the F4E contribution of buildings is progressing full speed ahead and on schedule. In tandem, development of the tender design for all the other buildings that are part of F4E’s contribution to the ITER project is also being carried out.